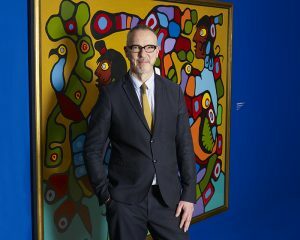 KLEINBURG, ON—On April 3, 2017, internationally respected art historian Ian A. C. Dejardin officially joins the McMichael Canadian Art Collection as its new Executive Director. Dejardin, 61, was selected following an extensive global search conducted by the McMichael Canadian Art Collection last spring. He joins the McMichael fresh from his 12-year leadership of the renowned Dulwich Picture Gallery in London, England. Dejardin’s fascination with Canadian art began decades ago when he stumbled upon a book featuring images of works by members of the Group of Seven and Tom Thomson. When he became director of the Dulwich in 2005, Dejardin took it upon himself to assemble the first big Group of Seven and Tom Thomson exhibition outside of Canada in almost 100 years, beginning a multi-year collaboration with the McMichael, which culminated in the record-breaking Painting Canada exhibition. Two years later, Dejardin co-curated From the Forest to the Sea: Emily Carr in British Columbia. He is currently collaborating with Sarah Milroy on a 2018 exhibition featuring the works of Canadian master David Milne. Dejardin holds a Master of Arts degree in the History of Art from the University of Edinburgh, and a postgraduate diploma in Art Gallery and Museum Studies from Manchester University. Dejardin succeeds Nathalie Mercure, who took on the Interim Executive Director role in September 2015. “Nathalie has been an outstanding contributor to the McMichael in her 18 months of leadership. Her positive attitude, collaborative leadership style, and methodical attention to detail have created a strong foundation for future growth, with a talented and engaged management team, an excellent exhibition schedule masterminded by Dr. Sarah Stanners, our Chief Curator, and a pervasive sense of optimism across our staff, our volunteers, and our visitors and patrons. We are forever grateful to Nathalie for her efforts and very happy that she has agreed to join our Board in the fall to capture her expertise and energy for the McMichael,” added Dunn. The McMichael Canadian Art Collection is an agency of the Government of Ontario and acknowledges the support of the Ministry of Tourism, Culture and Sport, and the McMichael Canadian Art Foundation. It is the foremost venue in the country showcasing the Group of Seven and their contemporaries. In addition to touring exhibitions, its permanent collection consists of over 6,000 artworks by Canadian artists, including paintings by the Group of Seven and their contemporaries, as well as First Nations, Métis and Inuit artists. The gallery is located on 100 acres of northern landscape and hiking trails at 10365 Islington Avenue, Kleinburg, north of Major Mackenzie Drive in the City of Vaughan. For more information: mcmichael.com.